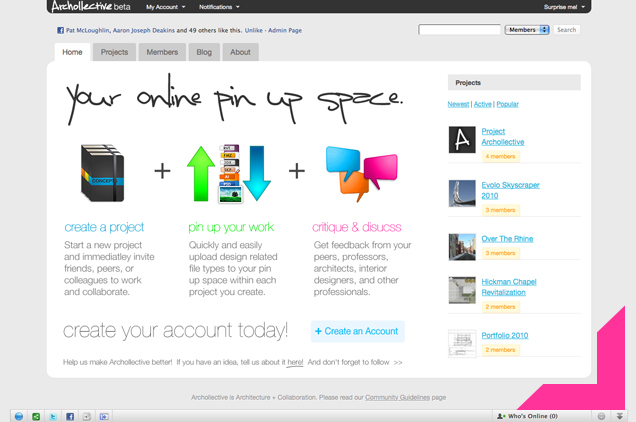 In addition to the “online pin up space” that Archollective offers, they also give the ability to easily share files, assisting greatly in the collaboration of group projects. Projects can be set up as public or private. Public allows for designers to get as much feedback as possible from the architecture community while private allows teams or firms to collaborate online without the general public seeing their project. This allows you to share files (psd, jpg, dwg, etc.) with your colleagues or peers easily even if you are all not in the same location. In the future this could really help out connecting international teams of architects working on a single project. This web application is created with the overall idea to help with the design process and collaboration of architecture projects. It is unique because it is not merely a way to promote yourself or showcase your work. It is a tool that architects and architecture students can utilize on group projects, individual projects, or even as a source for design inspiration. Archollective is still in its beta stages and will be releasing a second version in the next year. They are looking for more people to start using their website so they can develop and redesign the website to better serve the needs of the community. They open any feedback and in line with their concept they would love for you to critique their site.